The DCI World Championship returned to Canada in 1982, the second of two years it was held at Olympic Stadium in Montreal. Built for the 1976 Summer Olympics, the stadium is the only venue outside of the United States to ever host the World Championship Finals. After losing by just three tenths of a point to fellow West Coast rival Santa Clara Vanguard the summer before, the Blue Devils came out strong in 1982 steamrolling their way through 22 competitions without a single loss. Before it was eclipsed in 1984, the Devils' score of 95.25 at the '82 Finals, marked the highest ever to win the Championship. 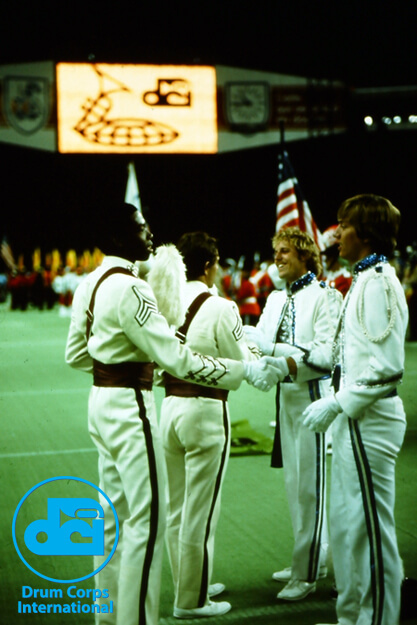 While the Cadets (pictured here congratulating the Blue Devils drum majors on their win), finished three points and two places under the Devils this year, the up-and-coming East Coast corps was just a year from grabbing its first World Championship title ever. Scanning and archival services provided by Drum Corps International corporate partner WeScanFiles.com.